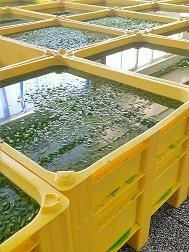 Seaweed snacks, popular in Japan & South Korea, are producted by Dalian Yihai Aquatic Product Co., Ltd in North China. Following a trial of 106 DOLAV ACE boxes in 2016 the company changed its whole processing system by introducing 2,120 DOLAV ACE pallet boxes in November 2017. Before introducing Dolavs, the company used a combination of plastic boxes and steel racks. 40% of the boxes were replaced every year and the steel racks rusted. Seaweed is heavy and difficult to handle and seawater is highly corrosive. Company owner Mr. Liu met DOLAV at China’s biggest seafood exhibtion in 2016. He saw the DOLAV ACE as the solution to his handling problems. 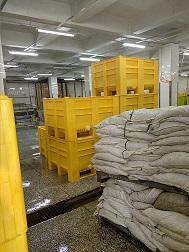 Concerned as much about hygiene as equipment druability, Mr. Liu thought that the raw seaweed could be received in DOLAV ACE pallet boxes, made from EU & FDA certified food grade materials. They could then be stacked safely, fully loaded, and used as well throughout the production process. DOLAV structural foam technology made the ACE Pallet Boxes more rigid and abuse resistant than boxes Mr. Liu had been buying from Taiwan & Japan. Yet they were lightweight and easily fitted with drain ports. Mr. Liu wishes he had found DOLAV sooner. “I am happy I now have a hygienic reliable and cost saving solution”, he said.